THE MEGA 148-PAGE FIREWORKS MAGAZINE WINTER ISSUE #81! The new issue of Fireworks Magazine is out NOW for online orders (in shops Thursday Dec 14th). 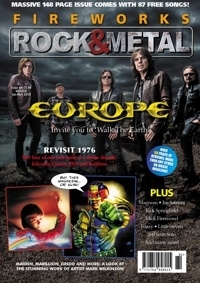 Our cover feature sees Joey Tempest discuss the new Europe album and why the band have left their 80s sound far behind. Also on our cover is the work of artist Mark Wilkinson, who in a fantastic six-page feature tells us how landed the Marillion cover artist job, which then led to other amazing projects including Judas Priest and Judge Dredd! Elsewhere in this issue we talk to Magnum main-man Tony Clarkin discussing the band's return to form with their new album, as well as detailed chats with Mick Fleetwood, Jeff Scott Soto, LA Guns, Fozzy, Rick Springfield, Joe Satriani, Sons of Apollo, Shakra, The Dark Element, Autograph, Von Hertzen Brothers, Elvenking and fantastic newcomers Midnite City. Little Steven tells us about his long and varied career in music and movies, while ex Battle Beast guitarist Anton Kabanen tells us all about his new band, Beast In Black. Add to that further interviews with Pink Cream 69, Dante Fox, Revolution Saints, Vice, Adrian Vandenberg, Delain, 10 Years, Almanac, Leave's Eyes and many, many more! On the features front, Dave Reynolds takes a look back to 1976, the magic year that saw the release of Rainbow 'Rising', Rush '2112' and, KISS 'Destroyer' alongside stunning debuts from Boston and Starz! With Sisters In Rock we take a look at the long careers of Doro Pesch, Ann Wilson, Ann Boleyn and Joyce Kennedy, while Bands That Time Forgot covers The Reggie Knighton Band and TKO. In the final part of his look back at the fanzine scene of the late 80s/early 90s, Rob Evans lovingly remembers the likes of Boulevard, AOR Basement and AOR Classics, chatting with those who were there, sweating blood and tears for the fans. So what else can you fit into 148 pages? Oh yes – over 50 pages of the best, most detailed CD, DVD and book reviews you can find in the Rock scene, as well as TWO free pdfs totalling 108 pages (so 256 pages in TOTAL this issue!) and 87 FREE mp3 songs! Absolutely THE BEST VALUE FOR MONEY ROCK MAGAZINE IN EXISTENCE!